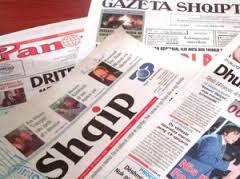 Interests of advertisers hinder media integrity in Albania. The advertising market has a profound effect on media integrity in Albania, due to factors including legal vacuum, small size of the market and dependence of media on economic and political actors. All these factors lead to a situation where although the transparency of the advertising market is quite low, there is little reason to doubt that there is a direct relation between advertisers and media content. The Law on Audiovisual Media poses a limit of maximum 30% share of the audiovisual media advertising market for a national broadcaster. However, due to lack of data on the advertising market, it is difficult to implement this requirement in practice. There are no other policies envisaged to ensure fair distribution of advertising among media, so for example private and public media are treated equally in terms of advertising limit. There are also no tax incentives for media and no government subsidies for media for any purpose, which leaves media adrift in the unsecure market. Through the years the media outlets have found themselves increasingly dependent on advertisers. The very structure and dynamic of the media market poses a challenge for media integrity and professionalism. The media market is oversaturated with more than 20 daily newspapers, more than 50 radio stations, about 80 TV stations and 80 cable TV stations, which is a large number in a country of less than 3 million inhabitants, considered one of the poorest in Europe. Estimations indicate that the total advertising revenue for the media sector is about €54.5 million1. Against this background, other factors to consider are that the majority of media owners have other economic interests, usually furthered by their own media, and that professional organization of journalists or a self-regulation process that would strengthen professionalism and media independence is very weak. Integrity of media practices can easily be the first victim in this overcrowded and poor market, where too many media outlets fight for a small amount of advertising. Another characteristic of the Albanian media advertising market is that most of its analysis is based on assumptions and sporadic data collected through the years, rather than solid and systematic data available for public scrutiny on a regular basis. “In Albania, there is not yet a bureau that verifies circulation and audience shares, as well as independent studies on these indicators, and this is a problem for the work of advertising agencies” (Th. Goga, qtd. in IREX, ‘Albania’ in Media Sustainability Index, 2014, p. 13). Unable and unwilling to come together and measure their popularity using common tools, the media outlets do their own research, usually by phone polling, and present these data to advertisers. In sum, the matter of publicly ranking popularity of media outlets remains unsolved for more than 20 years. In fact, this lack of transparency constitutes one of the main challenges and risks for media integrity. Lack of information on media performance has been both an excuse and a reason to distribute advertising in a haphazard manner at best, or in a clientelistic way, at worst. Governments, advertisers, and media have become entangled in a system based on clientelism, partly facilitated by the lack of transparency and inexistence of reliable data. Unfair and non-transparent distribution of state advertising has been a constant concern over the integrity of the Albanian media in the last years. There have been attempts to regulate fair distribution of state advertising, but any good intention to allocate state advertising is doomed to fail since, in the absence of reliable audience measurement data, one cannot establish beyond any doubt which media most deserve to be awarded state advertising. A few government decisions were aimed at determining criteria for distribution of state advertising and selecting the media that should carry public campaigns. However, the criteria have been far from clear, partly because a basic ranking and assessment of the media outlets was not in place. A 2007 decision by the Council of Ministers related to state advertising mentions the number of viewers or readers as one of the criteria to be used in making a decision.3 This criterion is clearly difficult to observe when data on audience measurement are lacking. Two latter Council of Ministers’ decisions seem to have very broad and vague definitions of the criteria, not even paying lip service to the criterion of the outlet’s audience reach. As a result, this has become a breeding ground for all kinds of speculations on how to distribute state advertising and how to “rank” the media when ranking is missing in reality. A recent investigation by B. Likmeta proved that there have been in fact significant clientelistic trends in distribution of state advertising.4 Data collected show that the state spent at least 780,000 euro between June 2012 and the end of 2013 on TV advertising. The bulk of this sum seems to have gone to TV stations and agencies owned by or tied to Aleksandër Frangaj, the owner of TV Klan and other companies. It is estimated that the five companies linked to Frangaj received a total of 730,000 euro for advertisements from state institutions over two years. By comparison, Top Channel TV, Albania’s other national private television, received a modest 9,940 euro over the same period.5 However, the investigation hints that the amount of public money channelled towards the network of companies linked with Frangaj is even larger than the sums mentioned. This is because the investigation was based on treasury data, which do not include money spent by state-owned companies, again pointing to the low degree of transparency in this field. Commercial advertisers: a necessary evil?! Commercial advertisers face the same challenge as state institutions in allocating advertising: companies need to decide in which media to place their advertisements in the circumstances where audience data are missing. Detailed information on advertising expenditures is missing. The overall feeling is that the market has been declining over the last years, but estimations of revenues are too irregular to enable firmer conclusions on this. As mentioned earlier, the overall advertising revenues in 2014 are estimated at €54.5 million. Market research firms and the media tend to agree as to who the main advertisers are: telecom operators, banks, and big companies (food and beverages, personal care products, etc). In sum, the advertising market is dominated by a few major companies, which become key actors for the survival of media outlets, as well as a major influence on their integrity. A trend noticed in commercial advertising is that given the size of major advertising companies, the lack of information on the market and reach of particular media become irrelevant. Namely, corporations that can afford it give money to all media, just as long as they remain silent or flatter the company. “Some of these companies are only advertising to keep the media’s mouth shut… using their ad budget as leverage in the editorial room.”8 Buying the silence of the media through advertising is in fact believed to be a prevalent practice so that specific companies are not singled out for such accusations. The most long-lived and evident case of total subjugation of editorial policy to advertisers has been the reports on practices of mobile companies in the country. So, when the competition regulatory body fined the country’s two biggest mobile operators for uncompetitive behavior in 2007 the story was reported only by a few media outlets.9 Similarly, when the same regulator started an investigation against Vodafone, it took many months for this story to be published in a few media, even though it is a story of public interest. These cases show the media content is significantly affected by major advertisers and instrumentalized for specific economic purposes. In sum, media content is significantly affected by factors other than journalistic values, and media are clearly instrumentalized for economic and political goals. Facing heavy financial dependence on big advertisers, including the government and commercial companies, media outlets are routinely subjected to adaptation of their editorial content to particular interests. What the cases above show is that these interests are reflected in both the content that can be found in the media, but also in the information that is being concealed. 2 Interview with Thanas Goga, R&T Advertising, 15 May 2013. 3 VKM No. 6223, “On procurement of productions/broadcasting of advertising and spots from state administration bodies in the media,” 29 September 2007.